The Point Defiance Regional Stormwater Treatment Facility is designed to improve the quality of stormwater flowing into Commencement Bay. See the Urban Green episode to learn more. The City of Tacoma and Metro Parks Tacoma shared a vision to provide stormwater treatment through a park amenity at the entrance to Point Defiance Park. Functionally, this facility is designed to capture the worst pollutants before they wash into an impaired area of Puget Sound overloaded with heavy metals from the Tacoma Asarco Smelter Plume, a toxic legacy from a copper smelter that operated for nearly 100 years. This innovative approach provides treatment for 754 acres in a footprint of only 5,500 square feet. This is a major step forward in improving water quality that can be replicated around the globe. As an amenity, this facility is designed to utilize a challenging steep slope and provide interest to the entrance to the park through an impressive six-pool waterfall. The concrete pools provide a powerful reflective mirror for all of us to see how we impact the world around us. It is sure to become an icon of Tacoma, as a defender of Puget Sound. The facility is located at the northeast entrance to Point Defiance Park. It is not open to the public but can be seen from all sides. The treatment facility consists of a series of cascade pools, distribution channels (troughs), and treatment cells with proprietary media and an underdrain system, that discharge treated water into a bioswale and ultimately Puget Sound. Puget Sound prairies inspired the landscaping. The native grasses and wildflowers will continue to evolve as the plantings become established over the next few years, while providing seasonal highlights and urban wildlife habitat. Stormwater from streets, yards and parking lots from as far south as North 30th Street, about two miles away, makes its way to just north of the park entrance where the stormwater enters the facility through a series of six cascade pools. At each pool, part of the flow is diverted through an opening into one or two distribution channels. The stormwater remaining within each cascade pool overflows through a weir and is conveyed down to the next pool. Up to 8 million gallons per day of the dirtiest runoff enters the bio-retention facility, while the higher flows go untreated into Commencement Bay near the Tacoma Yacht Club. Stormwater that enters the facility’s distribution troughs drops via gravity into treatment cells, which are topped with drought-tolerant plants that can tolerate wet winters, such as evergreen huckleberry. The cells are filled with Contech Filterra media, which has been tested and approved by the Department of Ecology and has received a General Use Level Designation. The plants, mulch, and filtration material trap toxic pollutants. Then the treated water from the drain system beneath the filtration media empties into a bioswale. The bioswale and a stormwater collection system convey the stormwater down to the Point Defiance Marina and Commencement Bay. Using natural processes, without requiring energy or chemicals, runoff is intercepted, cleaned and sent on its way to Puget Sound. This project is designed to treat up to 8 million gallons per day from the watershed’s 754 acres. It reduces the load of fine particulate matter including oils and greases from cars, waste from pets, and metals that are typically found in stormwater. This watershed is entirely located within the Tacoma Smelter Plume. Nearly half is within the Ruston Superfund Site and the rest is in an area designated with the highest level of contamination. The North Tacoma basin NT-02 currently outfalls near the old Asarco Smelter at the Dalco Passage and East Passage. This area is listed as an impaired waterbody for arsenic, copper, lead and zinc. Polluted stormwater is one of the largest threats to the health of Puget Sound. Here's a video from the Washington Environmental Council with more information. A $1 million grant from the Washington State Department of Ecology helped pay for the facility, along with funding from City of Tacoma Surface Water Management. Money from the $198 million Point Defiance bond issued to Metro Parks Tacoma helped to contribute to the overall project and the large excavation required for future improvements. The facility went online in early December 2015, about five months after construction started. The City will continue to monitor and make adjustments to fine-tune the facility’s effectiveness. Tacoma is a national leader in stormwater management, including green stormwater infrastructure. This project takes existing stormwater treatment technology and applies it in an innovative way to treat more stormwater. The City partnered with Metro Parks on outreach efforts for the facility. This included door-to-door invitations to public meetings and inclusion in the overall Park Master Planning efforts. Both agencies maintained web pages dedicated to the facility and a public education handout was developed. This project was featured in the Tacoma News Tribune and in a video by the Washington Environment Council (WEC). The City also developed an episode on Urban Green, a municipal television program. Throughout design, construction and post-construction, the facility has been promoted to other professionals and elected officials, including the "Sponge City Construction Technology and Management" program of the Chinese Ministry of Housing and Urban-Rural Development. This project will serve as a model in the development of larger stormwater treatment facilities. Lessons learned from this project will be applied to management of stormwater in other receiving waters. educational opportunity and will be an attractive asset to the entrance to the park. The landscape architect's vision for this facility is for it to speak for itself. The casual observer can see the dirty stormwater, polluted by mankind, enter into the "engineered awesomeness" of the cascading precast concrete pools. The water flows into the treatment cells where the water is filtered before it enters the natural looking swale, cleaned and ready to enter Puget Sound. The open channel design and physical connections clearly demonstrate how the facility works and its importance, without reading a sign or taking a tour. Interpretive signage will be added to the site in coordination with Metro Parks' Waterfront Phase 1 signage. The facility will also provide a teaching and research opportunity for students. Tacoma Public Schools has a rigorous Environmental Sciences program for high school students at Point Defiance called Science and Math Institute (SAMI). This summer their science teacher will study the facility with mentoring from University of Puget Sound professors. This fall SAMI students will do water quality testing or related experiments. The school-university partnership has already received $500,000 in grant funding. During concept and early design of the facility, the University of Puget Sound, University of Washington Tacoma, SAMI, and Citizens for a Healthy Bay, a non-profit environmental organization, were at the table. Their input helped drive the final design including the open channel conveyance. This concept will allow easier sampling and monitoring of the facility. On January 20, 2017, the Point Defiance Regional Stormwater Treatment Facility received a Silver Award for Engineering Excellence at the American Council of Engineering Companies (ACEC) 2017 Awards. This design competition recognizes engineering achievements of the highest degree of merit and ingenuity of design professionals and their clients. The Point Defiance Stormwater Project won Silver in the National, Waste and Storm Water category. It was one of the most highly-honored stormwater projects of the evening. On August 25, 2016, the Point Defiance Regional Stormwater Treatment Project received the 2016 Green Infrastructure Award from the National Association of Flood & Stormwater Management Agencies. Twenty-eight entries from across the country competed for the first ever Green Infrastructure Award. This project grabs national attention for three powerful reasons. It is a game changer for the stormwater industry. Treating more polluted stormwater than any other facility of its kind (over 750 acres from within the Asarco Smelter Plume). It serves as a park amenity at the entrance to Point Defiance Park with a prominent waterfall feature. It provides educational opportunities ranging from the casual park observer, to the SAMI high school students, and even local universities. The success of this project is due to the cross-functional nature of the landscape and engineering design team, which was led by the City and Metro Parks Tacoma. 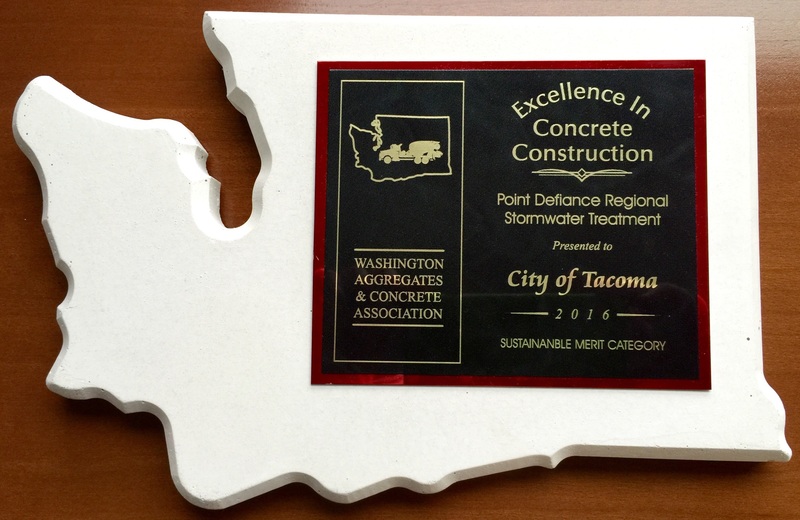 On April 28, 2016, the Point Defiance Regional Stormwater Treatment project received the 2016 Excellence in Concrete Construction, Sustainable Merit award for the Point Defiance project. This facility treats more stormwater than any other of its kind in the area, treating up to 8,000,000 gallons a day. Read about the Point Defiance stormwater facility and all the award-wining projects in the Seattle Daily Journal of Commerce's Building With Concrete publication.